Ustad Vilayat Khan Music Foundation presents Ustad Shujaat Khan & Ustad Zakir Hussain for a concert on 13th February 2017, Monday, 7 pm at Modern School Barakhamba Road, New Delhi. After a gap of many years the coming together of these great masters promises to be a unique musical event in Delhi's cultural calendar. In this special concert Ustad Shujaat Khan, the greatest North Indian classical musician will play Sitar and Zakir Hussain will play Tabla. Join us for the unique performance by the legends. With music that touches your soul, Shujaat Husain Khan is one of the greatest North Indian classical musicians of his generation. He belongs to the Imdad Khan gharana of the sitar and his style of playing sitar, known as the gayaki ang, is reminiscent of the delicateness of the human voice. 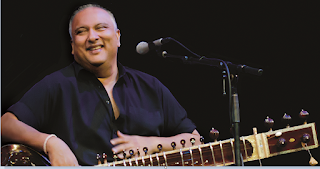 Truly international, Shujaat Khan has performed at all the prestigious music festivals in India and has performed throughout Asia, Africa, North America, and Europe. Audiences around the world are captivated by his unique style of sitar playing, his exceptional voice, and his intuitive and spontaneous approach to rhythm. In 1999, Khan performed as a soloist with the Edmonton Symphony Orchestra and in 2007, he was the featured artist at musical concerts celebrating India's 50th anniversary of independence at Carnegie Hall in New York, Paramount Theatre in Seattle, and Meyers Symphony Theater in Dallas. With hands that are capable of producing magic, Zakir Hussain is today appreciated both in the field of percussion and in the music world at large as an international phenomenon. His consistently brilliant and invigorating performances have not only established him as a national treasure in his home soil but also gained him worldwide fame. A classical tabla marvel of the highest order, his playing is marked by uncanny intuition and masterful improvisational proficiency, found in formidable knowledge and study. The favorite accompanist for many of India’s greatest classical musicians and dancers, he is never satisfied by his genius and is constantly working towards improving the music scene globally. He is widely considered one of the chief architects of the contemporary world music movement. His contribution to world music has been unique, with many historic collaborations, including Shakti, which he founded with John McLaughlin and L. Shankar, Remember Shakti, the Diga Rhythm Band, Making Music, Planet Drum with Mickey Hart, Tabla Beat Science, Sangam with Charles Lloyd and Eric Harland and recordings and performances with artists as diverse as George Harrison, YoYo Ma, Joe Henderson, Van Morrison, Airto Moreira, Pharoah Sanders, Billy Cobham, Mark Morris, Rennie Harris, and the Kodo drummers. His music and extraordinary contribution to the music world were honored in April, 2009, with four widely-heralded and sold-out concerts at Carnegie Hall’s Artist Perspective series.